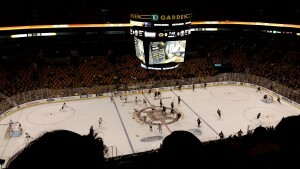 Back in February, Cade and I were able to make it to another Boston professional sports team game..this time the Bruins. 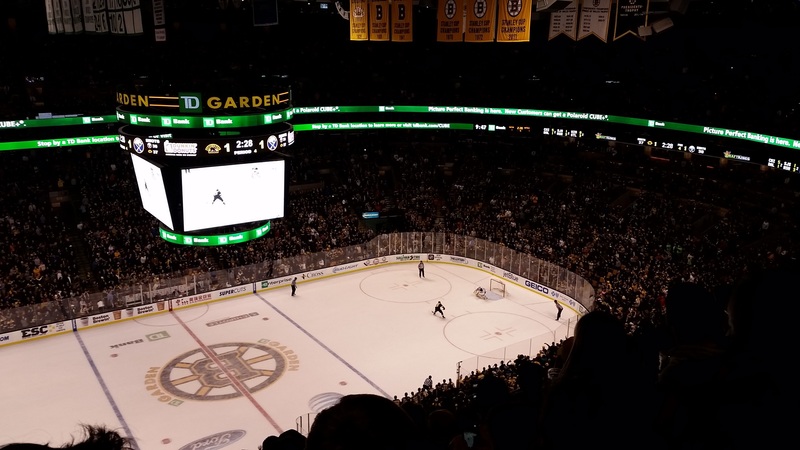 As a reminder, one of our Boston goals is to attend at least one sporting event for each Boston team (excluding the Patriots, that would be sacrilegious) and our college teams. 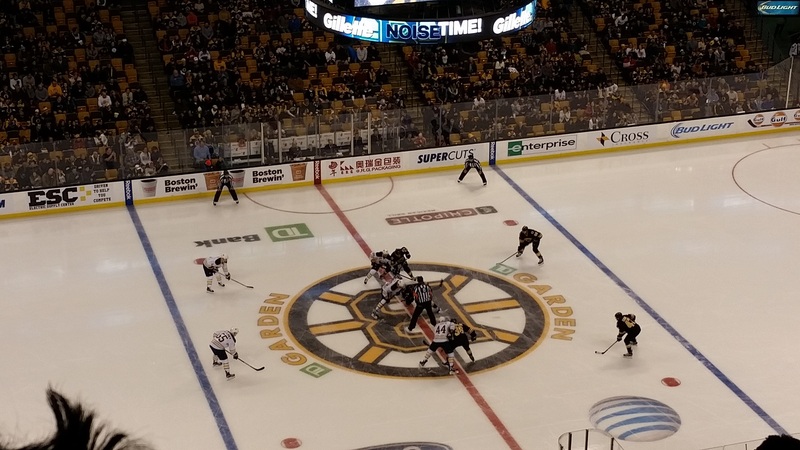 So far, we’ve been able to attend a Celtics game, hockey and football at Harvard, and hockey and football at Boston College. For Christmas, Meem got us tickets as one of our couples gifts, which was followed by a bit of a freak out. 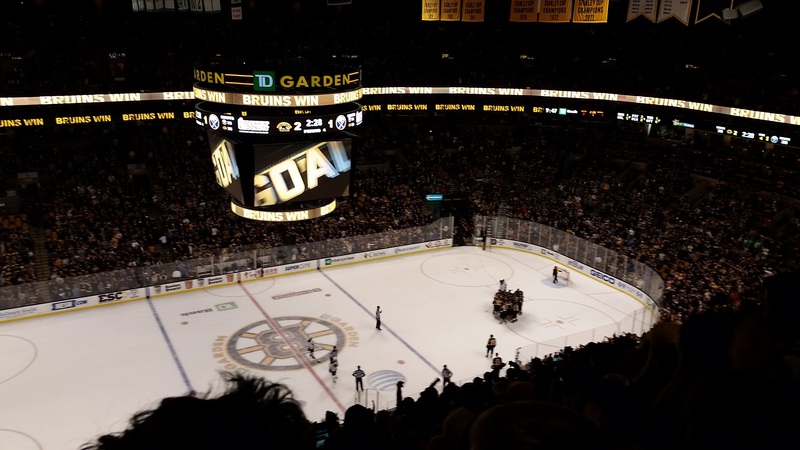 Fast forward then to February, and it was time to make our way to TD Garden to see the Bruins take on the Buffalo Sabres. From the moment we got there, the energy was high. I’ve come to find that Boston is a very proud city, and their sports teams are no exception to this. 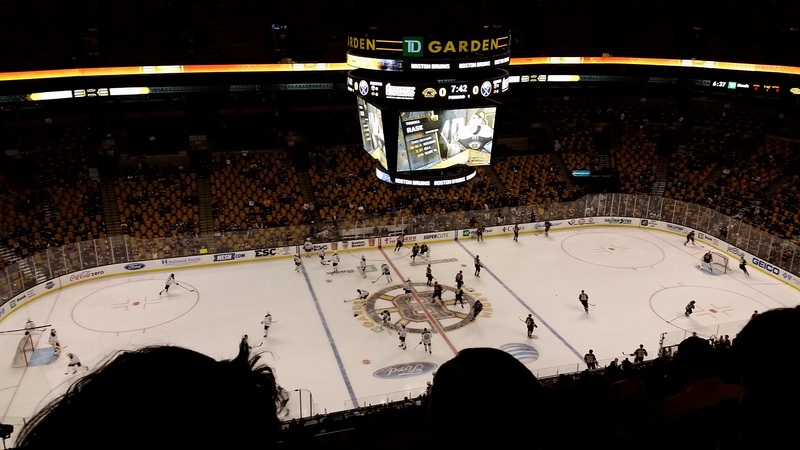 We were a little nervous about the game considering that all of our previously attended hockey games ended in either a tie or a loss. However, score aside, we always enjoy being able to attend games. The intermission entertainment at sporting events is usually pretty good and exciting to see. 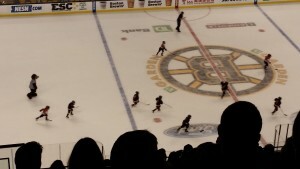 During one of the intermissions of this game, there was a bitties team of little ones that were likely around 5-6 years old that came out to play a short game. It was adorable, and we got to finally see Blades the Bruin! It’s always a happy game when we’re able to have some time watching the mascot. You might remember our fascination with Baldwin the Eagle. 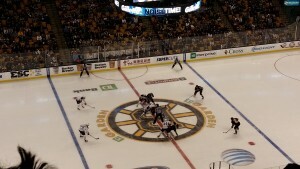 The game was quite interesting, with the occasional fight as is customary for hockey, and was close the whole time. It ended up going into overtime, and I was crossing my fingers that another tie wouldn’t be in store for us. Sure enough, the curse was broken when a penalty was called on the Sabres giving the Bruins a penalty shot. (For those not versed in hockey, this is when one player from the team not in offense of the penalty gets a chance to shoot a goal with only the goalie. This always results in tons of suspense and excitement!) 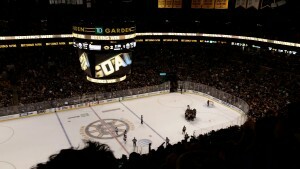 So, a Bruins player came up to the puck and shot for the penalty shot, and got it, ending the game with a victory! Everyone went crazy, especially one man in particular sitting in our section who immediately went around shouting and giving out high fives. It was a fantastic way to end the game, and we finally got to see our team come out on top. Special thanks to Meem for helping us fulfil our Boston goals. Last up will be a Red Sox game. Also, “However, it was an enjoyable game, aside from the score.” were you referring to the past games? I am so glad that you had a good time, honey! I wish that I could fix it so that I get emails when you update. I get them for Cade’s blog, but not yours.